Sign up and receive Property Email Alerts of Warehouses to let in Uraniaville, Klerksdorp. 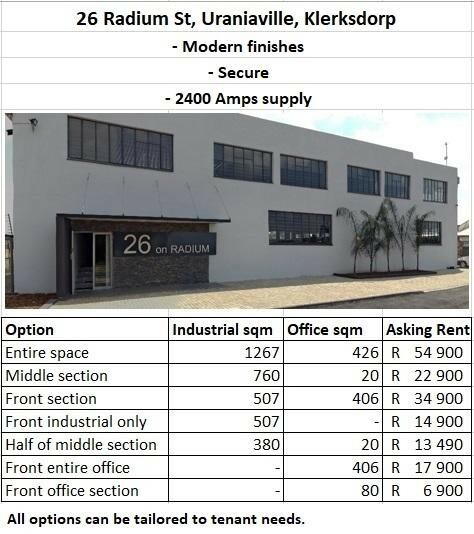 The renovated industrial building with pristine offices in Uraniaville is available to let. AAA-grade building, which is in an immaculate condition. Note: These spaces can be divided, combined or extended - we like full engagement with clients. The building has 2400 Amps electricity on the premises with its own substation, which means that you can operate the biggest factory or most energy-intensive operation imaginable from there. Sign-up and receive Property Email Alerts of Warehouses to let in Uraniaville, Klerksdorp.